Photo Report – The Comings And Goings of The CroAF MiG-21 | Achtung, Skyhawk! And while this does sound a bit OCD, it goes a long way to showing just how engrained the MiG-21 is in the Croatian collective aviation consciousness :). Pretty much part of the local aeronautical identity, the CroAF fleet has always been considered the elite of the flying world, spawning a cult following not unlike that of the rock stars of the 70s and 80s. Making up in charisma everything they lack in actual capability, the MiGs are instant show-stoppers wherever they appear, with the five “new” jets bought in the Ukraine quickly becoming the most anticipated and talked-about aircraft of the year. Thanks to colleagues in the know, I’ve once again found myself near the cutting edge of developments, the upshot of which is an ever-increasing collection of shots of all forms and colors :). So, to introduce some law & order to proceedings, I’ve decided to open a single topic that will cover the fleet’s test flights and early operations, adding photos as I snap them. With two day’s worth of material already processed and ready, I’m delighted to present (eventually) Messrs 131, 132, 133, 134 & 135! Looking quite good seconds from landing on RWY 05. While the switch to Air Superiority Grey was unavoidable due to NATO standards, the AF had at least tried to make the new scheme a bit more lively, primarily through addition of the Croatian coat of arms to the fin and both upper and lower leading edges of the wing. Another very welcome touch is the return of the knight’s helmet nose emblem, made locally famous during the 90s civil war. Returning back home to RWY 23 after its first high-altitude supersonic flight. Flown at 64,000 ft (19,500 m), this mission had required some special equipment, most important of which was a high-altitude pressure suit and its associated helmet (which, as can be seen in the shot, offers a very restricted field of view). The morning’s sunny skies had also lured out 135, seen here ending its second post-assembly flight. Pretty stock except for a few bits of modern Western navigation equipment shoehorned in among ancient Soviet systems, both jets are nevertheless said to be a significant improvement of the existing fleet (though the latter will – the situation in the Ukraine permitting – soon undergo a thorough rejuvenation program). A welcome splash of color as an understated, conspicuous 165 grumbles in for landing after its second test flight. Pretty much the most recognizable of all the CroAF MiGs, “Kockica” – Croatian for “little square” – was part of the seven-strong batch of jets sent to the Ukraine for overhaul. So far, it is the only one to actually fly – and is currently the only operational twin-stick model in the fleet. Striking quite the photogenic pose, 165 recovers into RWY 23 after a training sortie. The lead ship of a three-jet formation – consisting also of 133 and 135 – Kockica had been on a practice flypast above the town of Knin in preparation for the Victory Day parade on 5 August. Today’s outing had also allowed me to snap a good shot of the elusive 133. The first of the three to land, 133 was the newest single-seater to reach operational status. One of several CroAF flights of the day – which had eventually included two more MiGs, an AT-802 and Mi-171 – “Knight 96” is seen recovering home after another training flight. Interestingly, even though the fleet has been up to strength for some time now, this was one of 167’s few outings since refurbishment – indeed, this is the first shot of it have since its camo color days! ADDENDUM: given that the new MiGs are still hot news here in Croatia (and abroad as well if this post’s view count is anything to go by! ), I’ve decided to expand my little gallery with a short set of photos by Petar Mežnarek. A friend of mine and spotting colleague who works at (and lives near) Zagreb Intl., he has naturally had many more opportunities to observe the fleet in action – and given that he also sports a quality camera and lens setup is the perfect person to give this thread more substance :). The first instance of what will eventually become a common scene in Croatian skies – a grey-on-grey formation taking off for another local test flight (likely to tune the radar again). Fresh out of the post-assembly test program, 135 leads 122 and 121 on a flypast down Lake Jarun during the 2014 Armed Forces Day. Then (1 June) still the acting QRA pair, 122 and 121 can be seen carrying the weapons pylons for their AA-8 heat-seeking missiles, as well as the MiG-21’s distinctive 800 liter centerline droptank. Fully kitted out to operational QRA specification, 131 and 135 blast out on one of their first practice scrambles. A sight we’ve been waiting to see for ages! 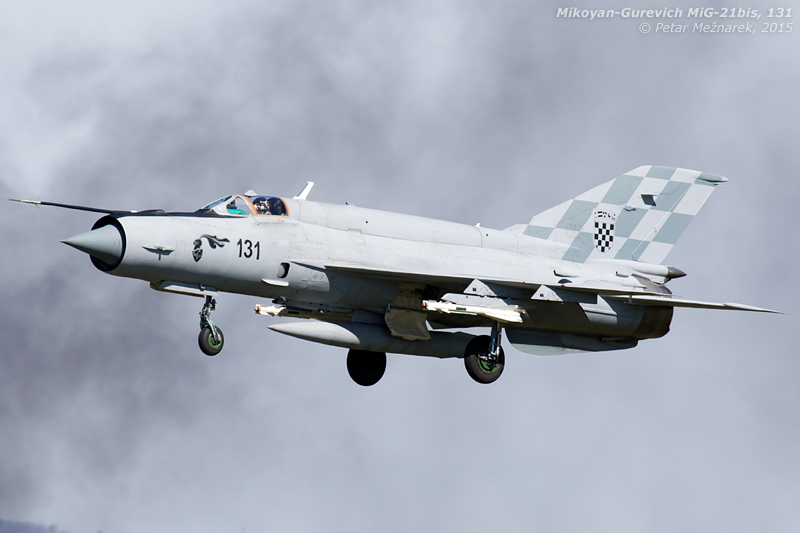 Very few sounds at Pleso are as evocative as a MiG-21 at full chat. Even though the R-13 engine of the twin-stick UM is significantly less powerful than the meaty R-25 of the bis single-seater, it can still put up a show! While flying past the smoke of a burning garbage heap may not be the most heroic of settings, it does however bring out some of the visceral appeal of the MiG-21. And despite its significant operational shortcomings (not to mention its general lack of sophistication in today’s terms), in the right hands the design can on occasion still put up a fight. 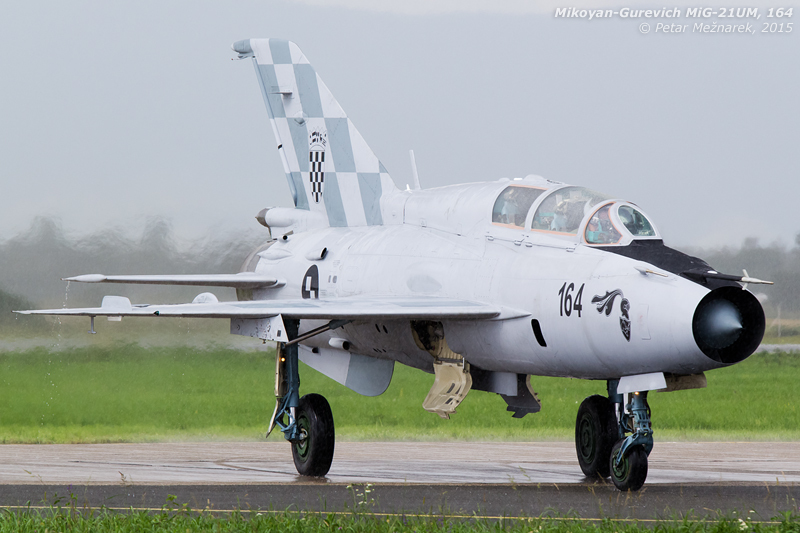 Pingback: Photo Report – The Wizard Of Kranj: YuAF Aircraft Restored | Achtung, Skyhawk! 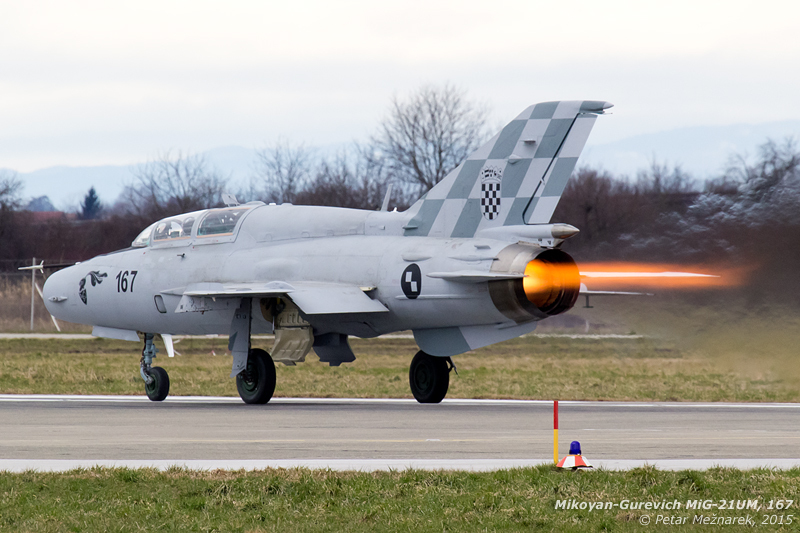 Pingback: Photo File – Reheat On: The Croatian AF Back On Strength | Achtung, Skyhawk!